First photo is from the Richmond Times Dispatch showing Marie Kerse’s music studio in the year 1909, second shows sisters left to right, Ali Holshouser Orcutt and Annie Holshouser in 2014, talented musicians themselves who might have inherited their talents from their great-great Aunt Marie! Ali and Annie play piano, percussion, violin, saxophone, bells, and they both sing beautifully. Marie Botto Kerse Maher was a twin and my great-aunt. I wrote about her twin sister Kate who died at age 17 week before last and you can find that story at this link to the post titled Kate Kerse, Twin and Young Artist Dies at 17 –52 Ancestors in 52 Weeks #37. What a duo they must have been growing up! Think of all the passion and joy such talented artists would bring to the family. They must have been recognized in their church and community as well, as the stained glass window depicting sisters was dedicated at their church when Kate died. Apparently Marie played the organ there at St. Patrick’s Catholic Church on a regular basis. Now, a hundred years later, I am thinking about them and trying to preserve their stories for our family. Marie, 1878-1961, was the daughter of James Kerse, a Sergeant on the Richmond City Police force and his wife Mary Catherine Botto. I have written of these families before and you can find links to them and others about the family below. This post is about Marie, one of four children, whose baby brother Andrew Leo Kerse died at age one when she was 9, and whose twin sister died when they were 17. She was no stranger to death when her mother died and Marie was only 28 years old. She married Joseph Franklin Maher in 1913, when she was 35, had one child, Joseph Jr. at 36. Both of her parents were gone by her age 43. That is a lot of loss in a lifetime. I wonder if her music sustained her, or just kept her so busy, that she didn’t have time to think! I know her music kept her busy, because I have found a treasure trove of information about her on genealogybank.com from the Richmond Times Dispatch newspaper in Richmond, Virginia. The picture of her studio in 1909 shown above was one of the treasures found there! I never met this great Aunt of mine and it was so much fun to get a glimpse inside her home and studio! I found an interesting pattern when searching for articles about Aunt Marie. From 1903, when she was 25, until her death in 1961, she operated a music studio out of her home!. Granted, she had a nice home in downtown Richmond, but it is reported that she had over 100 students some years! Every Fall you could find an article about her school starting and the need to register. Every June, you can find an article in the Richmond Times Dispatch about her recitals! She awarded medals and recognized her students liberally. Many were recognized for their talents in the newspaper. As I perused the articles, I was interested to see pupils from some families I recognized. In 1903, she was teaching two of her own Botto nieces, Kate and Marguerite. There is also a Josie Clements in this article. One of my genealogy researching cousins is Elizabeth Clements Mims, I suspect this student was in her family. Another family connection is the Bickerstaffs, and there in the review for 1912, you find students named James and Anne Bickerstaff! There are Spindle and Hancock students as well, all names I recognize. How much fun is that! There are other names I took note of. One name that was very interesting to see, was in 1905, Joseph Maher was Marie Kerse’s student–ten years later he became her husband! Took him long enough! The recitals were obviously elaborate.They were held at venues like the Thomas Jefferson Hotel in downtown Richmond, and other Halls around town. There were all kinds of performances as you can read in the articles below, it was amazing. My sister Anne remembers attending one of the recitals when she was a young child of six, shortly before I was born. She remembers that it was held at the luxurious Women’s Club in Richmond, and that our Aunt Gwendolyn Youngblood Tucker took her to the recital, my father’s sister! (the other side of the family, seems curious?). 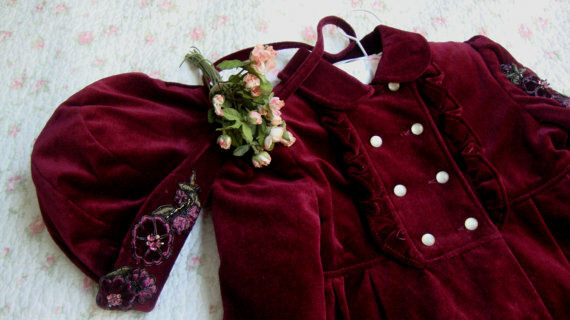 She also remembers something I find amazing, that our mother made her a coat and bonnet out of a wine red velvet! Anne still remembers Mother talking about what an important event the concert was. Anne was the first of four children born to our Mom who worked full-time–I don’t remember her ever sewing! Anne remembers Aunt Marie fairly well, and says Marie was always good and kind to her. I found this picture of a coat and hat very similar to that which Mom made for Anne in 1947. I never met our Great Aunt Marie, and was surprised when my research showed that I was 12 years old when she died! She was well known in my home town, why had I never met her? In fact, my sister and I both took piano lessons, but not from her. My older brother and sister sang beautifully! Musical talent apparently runs in the family. It didn’t take much asking around until I began to hear that of course, once again there had been a split in the family! I am genuinely surprised, because I had always thought it was only my father’s family that did that, not my Mom’s. It seems they were just quieter about their estrangements! I learned there were several “incidents” that played into the split relations. 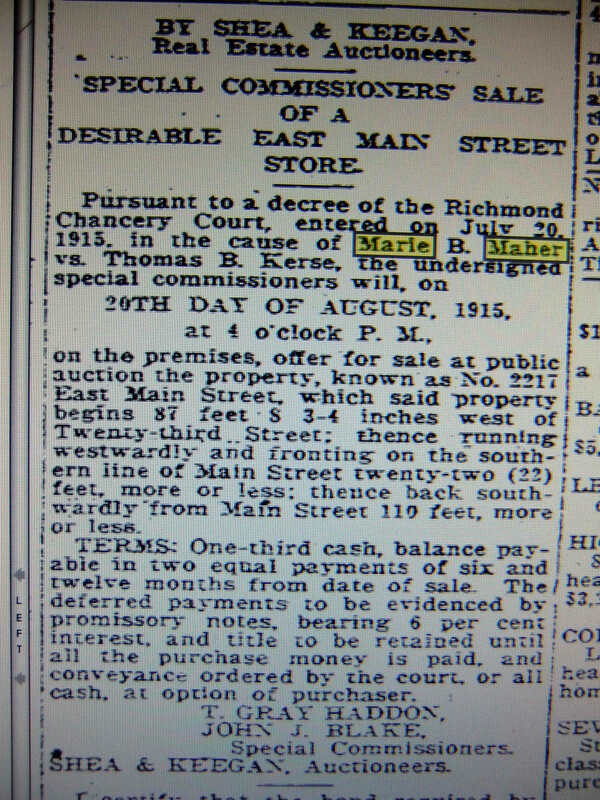 I found one in the newspaper archives!In 1915, Marie apparently sued her brother Thomas P. Kerse, my grandfather (my mother’s father) and the courts made him sell some land I assume they had inherited from their mother Mary Catherine Botto who died in 1906. She had inherited the property from her mother, Marie and Thomas’ Grandmother, Catherine Botto Raffo who died shortly before her in 1903– she was a business woman who owned several properties around Richmond. Earlier I had learned that Mary Catherine’s brothers, Marie and Thomas’ Uncles, had sued each other over the property they had inherited, forcing the sale of five prime properties in Richmond. Apparently there was another reason for the falling out, so much so that Thomas forbid his children to have anything to do with their Aunt Marie or their cousin, her son Joe, how very sad! Or maybe Marie is the one who did the forbidding, I really don’t know, all I know is that we didn’t know each other. Anne says she does not remember seeing Aunt Marie after she was about 7 years old. The other story that I have been told by several family members, is that when James H. Kerse, my great-grandfather, father of Marie and Thomas, died in October, 1921, even though Thomas, his wife Kate and their six little children had taken care of him for many years, Marie inherited the house. James probably thought Thomas and Kate would be fine on their own and thought he should take care of his daughter. According to the story, Marie demanded that they move out even though they were living there one year after James’s death when their own 8 year-old son Thomas Jr. drowned in October, 1922. Kate was pregnant with their seventh child by January 1923, when Marie made them move. So much stress, it had to have compounded the emotions. Regardless of the cause of the split in the family, Marie was obviously a very talented musician. Perhaps she was temperamental and high-strung like many artists are. She was also a very busy business woman when few women were professionals! She was an entrepreneur who ran a music studio out of her home, and had over 100 students enrolled year after year! I find it very interesting that we come from a long line of professional women. In this line especially, Catherine Botto Raffo, born 1825 in Italy,was a professional businesswoman, owning property and collecting rents. Her daughter Mary Catherine Botto Kerse, b. 1858, took over for her. 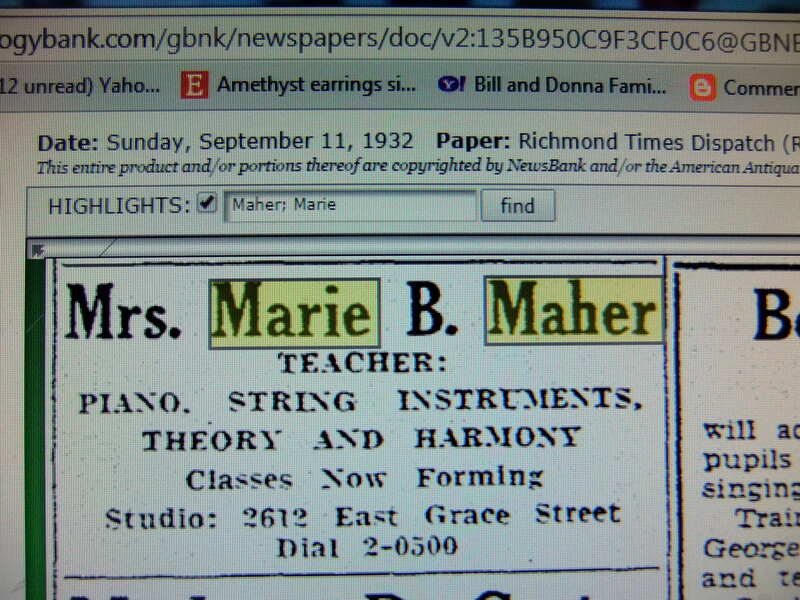 Mary Catherine’s daughter Marie,b.1878, is the talented musician and business owner herself! Kate, b. 1883, Mary Catherine’s daughter-in-law, Thomas’s wife, was a professional nurse, and before 1915 had a business where she and her partner sold jewelry and did watch repairs. All six of her daughters were educated and worked as realtors, teachers, and social workers! Our generation of women has continued this professional identity as teachers, financial advisors, psychologists, nurses, etc. We have been told women didn’t work until after WWII and the 1950’s. Well, in our family, we come from a long line of women intrinsically motivated towards professions which makes me proud. Besides having her elaborate recitals covered in the newspaper, Marie placed regular memorials to some of her loved ones in the newspaper on the anniversary of their deaths. She wrote them poems as you can see in my post about her grandmother, Catherine Revaro Botto Raffo. She posted for her mother as well. But one amazing thing I found, was a memorial she published for her twin sister. It was amazing because the name we had from the records at St. Patrick’s Church were different from the name published in the newspaper, given by Maire. The church said her sister Kate was named Kathleen Kerse. 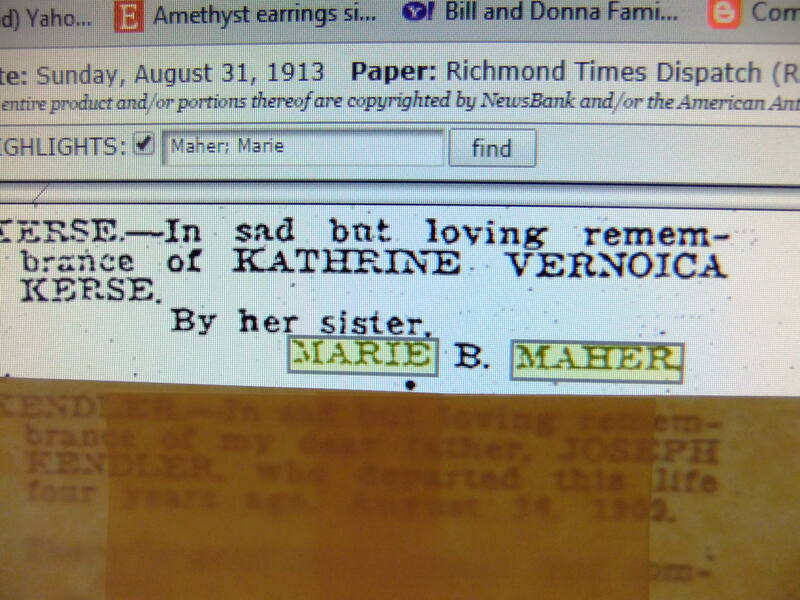 the memorial left by Marie for her sister, named her as Katherine Vernoica Kerse! I wonder if the middle name was a typo on the part of the newspaper. But my sister nor myself ever heard the name Veronica or even Victoria being in our Kerse family, much less Vernoica! Katherine however, is a popular name in our family, every generation has one or more, and I’ve never known anything but good things about any and all of our Katherines, Kathryns, Catherines, Kates and Katys! I’m going to have to do some more research for Kate. I am including articles from the Richmond Times Dispatch archives from Genealogybank.com, although I know they are hard to read. I believe some family and friends will be interested enough to be thrilled to find these clippings here. They are much easier to read on genealogybank by the way, the problem is in my photography of the articles! Thank you for joining me in my family reminiscing, please share yours with me. 4. Thomas Philip Kerse– Irish Cop like his Dad–52 ancestors in 52 weeks! Categories: 52 ancestors' stories in 52 weeks, Botto/Raffo/Revarro family posts, Genealogy, Kearse/Kerse family posts, Maher family posts | Tags: James H. Kerse, Joseph F. Maher, Kerse Music Studio, Marie B. Kerse, Marie B. Maher, Music Teacher Marie B. Maher, Richmond, Thomas P. Kerse, Virginia | Permalink.